It is a simple but deft piece of carving and joinery, in its balance of skill and thought an example of perfect craftmanship. Spooner has used just the right amount of technical proficiency. Any more would have been showing off, and the work would have been cluttered. Any less and the effect would have been spoiled because the viewer would be distracted by anxiety about whether it would hold together. As it is I feel confident that what I see is what was intended. 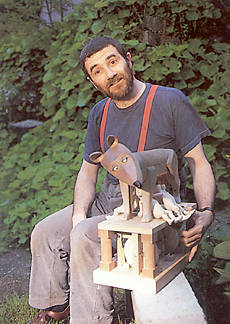 Paul Spooner is probably the greatest maker of contemporary automata and much of his work is featured on this DVD. It shows in some detail how difficult the automata maker's art can be and illustrates how even the great can make mistakes... regularly. I went to see Victor Erice's wonderful film,"The Quince Tree Sun", just before visiting Paul Spooner and "Made in Stithians" pays a tongue-in-cheek tribute to it. I followed Paul Spooner through the various stages of his working process as he attempted to make a new machine in one day. Running time is approximately 35 minutes. Available from CMT.